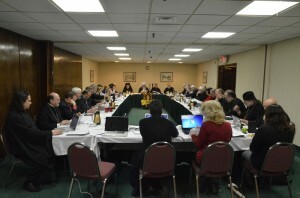 SYOSSET, NY [OCA] – The Lesser Synod of Bishops and the Metropolitan Council of the Orthodox Church in America met at the Chancery here February 25-28, 2013. His Beatitude, Metropolitan Tikhon presided at the sessions. Members of the Lesser Synod who participated included His Eminence, Archbishop Nathaniel; His Eminence, Archbishop Benjamin; His Grace, Bishop Michael, secretary of the Holy Synod of Bishops. His Eminence, Archbishop Nikon also attended. Highlights of the meeting, according to Archpriest Eric G. Tosi, OCA Secretary, included the following. In his opening remarks, Metropolitan Tikhon spoke about the first 105 days of his ministry as Primate. He expressed gratitude for the prayers and support of the Church, the Holy Synod, the officers and the Metropolitan Council. He spoke of his regular weekly meetings with the officers and the multitude of tasks accomplished by Chancery staff members. Archpriests Chad Hatfield and David Lowell shared their thoughts on the organization of the Metropolitan Council meeting and on ways to keep the operational aspects focused on the topics. They also suggested referring some discussion items back to committees for representation at a later point in the meeting. To this end, the agenda was adjusted to allow for committee and Lesser Synod meetings on Wednesday afternoon. Archpriest John Jillions, Chancellor, highlighted five goals pursued in the immediate past and central in the future—creating good working relationships, building a stable and effective Central Church Administration, working to overcome a culture of negativity, ongoing work in addressing pastoral misconduct, and continuing progress in the area of financial development. He introduced Cindy Davis, recently engaged Coordinator for the Office of Review of Sexual Misconduct, who addressed a number of concerns and reported on her work as she settles into her new position. In his report, Father Tosi reviewed the extraordinary 17th All-American Council and the Enthronement of Metropolitan Tikhon and addressed issues related to human resources, archives and estate management development, and communications. He also reported on a number of meetings and events with which he had been involved and reviewed progress made in implementing action items related to resolutions from the 16th All-American Council. Melanie Ringa presented comprehensive financial and internal auditors’ reports, highlighting critical budgetary issues and budget-related action items. In cooperation with the Finance Committee, these changes were presented and approved by the Metropolitan Council. A complete financial report incorporating these changes will be forthcoming. She reviewed the proceedings of the second annual meeting of diocesan chancellors and treasurers and progress being made on developing alternatives to the present assessment method of funding. [See related article]. Concurrently, the Financial Development Committee is working towards a method acceptable to all dioceses, as mandated by the 16th All-American Council. Archpriest Leonid Kishkovsky reviewed recent developments in the area of external affairs and inter-Church relations. 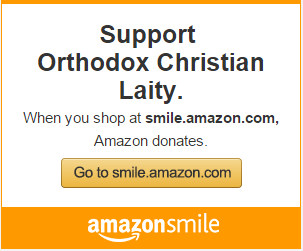 He reported on various visits and events, including the Enthronements of His Beatitude, Patriarch John X of Antioch and His Eminence, Metropolitan Antony of the Ukrainian Orthodox Church of the USA, as well as meetings with a number of Orthodox hierarchs in North America. The Lesser Synod expressed its gratitude to Father Leonid for his critical work during a difficult time in the life of the Church looks forward to his ongoing work as Director of External Affairs and Inter-Church Relations. Priest Gleb McFatter reviewed the work of the Finance Committee and Pension Board, while David Yeosock, on behalf of the Finance Development Committee, reviewed possible plans for financing the Church and reinvigorating the Church’s financial situation. As part of a new initiative to incorporate presentations by Department chairs into Metropolitan Council meetings, Andrew Boyd, Chair of the Department of Youth, Young Adult and Campus Ministry, highlighted the Saint Peter the Aleut Grant Program now available for youth and youth workers. Funding for the program was made possible through a bequest received by the Department. He also spoke about the successful “YouTube Challenge,” the winner of which preached at the young preacher event, and outlined other initiatives, webinars and social media concerns. [See related stories here and here]. Archpriest Ian Pac-Urar reviewed the work begun by the new Department of Continuing Education, which he chairs. He reported on the the results of a recent survey on continuing education initiatives and answered many questions on the new department’s goals and scope. The Legal Committee, chaired by Judge E. R. Lanier, discussed various Church-related legal matters, adding that a written report for the Church-at-large would be forthcoming. General Council Thaddeus Wojcik also reviewed his work and spoke of development of a training session on fiduciary responsibilities. After additional committee reports were presented, Council members voted to combine the membership of the Internal Governance Committee and the Council Development Committee in recognition of the similarities in the committees’ responsibilities. A Fall 2013 retreat for Council members as well as completion of a talent survey and a compilation of biographies of all members are planned, together with updates to the Metropolitan Council Handbook. The Post-Conciliar Committee reported on the implementation of the eight initiatives approved by delegates to the 16th All-American Council. Much progress has been made with regard to diocesan initiatives, such as leadership, continuing education, contemporary moral issues and evangelization. Although each diocese is responding within its own specific time frame, great progress has been made. Council members made a significant recommendation concerning the 18th All-American Council, slated to convene in 2014. Father Tosi reported on projected dates and venues for the Council, adding that preliminary work with regard to establishing a Preconciliar Committee had been undertaken. In response, the members of the Metropolitan Council decided to recommend to the Holy Synod of Bishops that the 18th All-American Council be delayed by one year—until 2015. Their rationale was based on a number of criteria. Among them is the desire to avoid additional financial burdens that might be placed on parishes, especially in light of the unexpected expenses incurred in convening the extraordinary 17th Council in 2012. It also was noted that, due to the time spent planning the 17th Council, there would be less time available for planning and convening a Council in 2014. Consequently, it was the feeling of Metropolitan Council members that sufficient time must be spent in producing a “solid finished product” that has been fully explored and agreed upon for the Church, particularly in the area of finances and Statute revision. Further, it was felt that, since the next Council will be held during the summer to ensure youth participation and activities, as well as to coordinate efforts with the Fellowship of Orthodox Christians in America [FOCA]—the FOCA’s annual convention will be held concurrently, in partnership with the All-American Council—additional planning time is essential. Metropolitan Tikhon further expressed his desire to witness “a period of peace and calm as we move forward with the work of the Church.” Among the sites being considered are Detroit, Baltimore, and Cleveland. With these and other factors in mind, the members of the Metropolitan Council voted to recommend to the Holy Synod that a delay of one year be effected in order to develop a clear and definitive plan for convening the Council with clear and definitive objectives for the Church. 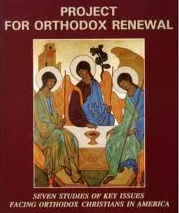 The Holy Synod will consider this proposal at its Spring Session March 12-14, 2013. The next Metropolitan Council meeting will be held September 23-26, 2013. Minutes and reports will be posted on the OCA web site as they become available.